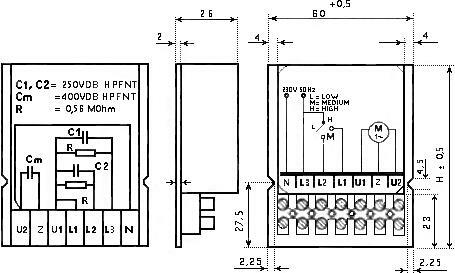 TYPICAL APPLICATIONS: Capacitors modules are intended for use in ventilation and extraction systems for regulation of three motor speeds with capacitor switching. PRINCIPLE OF OPERATION: By connecting the motor to a change-over switch, one necting the motor to a change-over switch, one necting the motor to a change-over switch, one capacitor circuit to other is activated, producing different combinations of capacitance and reactance that result in three output levels. Plates: Aluminium and Zn layer deposited by evaporation under vacuum. Case: Plastic materials self-extinguishing grade V0 according to UL 94 standard. Resin: Non polluting filling compound made of vegetable oil (non PCB) improving the protection of the winding and the functioning of the capacitor.